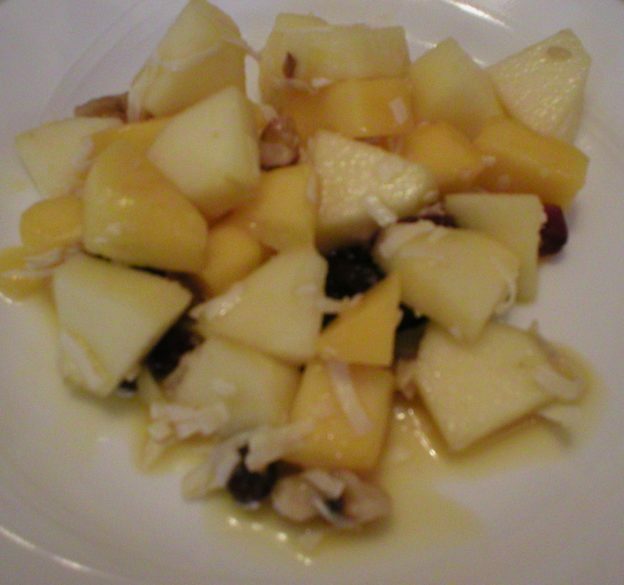 If you’re looking for a delicious yet very flexible fruit salad that you could easily adjust to fit your preferences, this is it! The recipe calls for mango, but if that’s not available, peaches or nectarines could easily be used if they are in season. However you go with this recipe, it’s truly delicious and would work as a meal accompaniment or a healthy dessert or snack. Give it a try! Below is a video showing how to make the salad. The recipe is below the video. Enjoy! If adding honey (or some other sweetener) to the orange juice, stir it into the juice and allow it to sit for 5 to 10 minutes because it will take a little time for the sweetener to dissolve in the cool juice. Meanwhile, cut the apples and mango and place the pieces into a bowl. When the orange juice mixture is ready, stir it then add it to the cut fruit and toss to combine. Be sure the apple pieces are well coated with the juice to prevent them from turning brown. Now add in whatever dried fruit, nuts, and coconut flakes you want. Stir to combine well. Cover and chill for an hour or two before serving to allow the flavors to blend and the fruit mixture to soak up the juice. Stir and serve. * If you can’t find mangoes or aren’t fond of them, you could use fresh peaches or nectarines as a substitute. They would be best if used when in season. 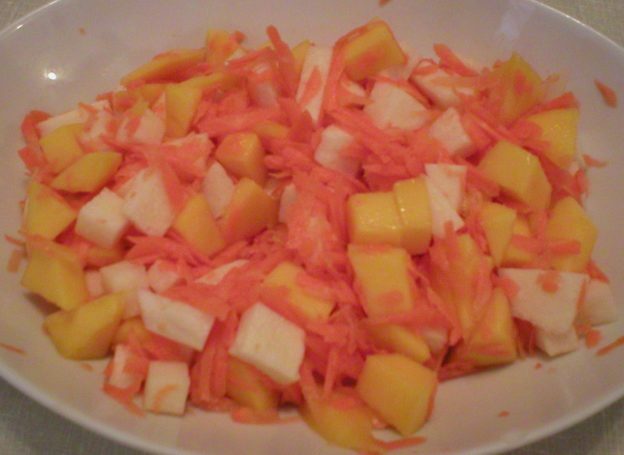 This entry was posted in Food and tagged apple fruit salad recipe, Apple Mango Salad, dessert recipes, fruit salad recipes, mango recipes, mango salad recipe, peach salad recipes on March 6, 2019 by Judi.